Monastery Kaneydzi was one of the main Buddhist centers of Edo, and Kiyomizudo was one of the main temples of this monastery. The name of the monastery – “Kanayiji” – comes from the name of the era, it was built in 1631. Its founder was the monk Tenkai, who wanted to build a copy of the temples of Kyoto in order to raise the authority of Edo, in which the shogun lived. Kiyomizudo repeats the famous temple of Kiyomizudar, but smaller. The pond of Sinobadzu no Ike near the temple imitates Lake Biwako near Mount Hiejzan. An artificial island with a small Bentendo temple was built in the pond, as in Biwako. The beauty of the temple was reflected in the verses: “Kaneyiji, Ancient temples, in the brilliance of gold and silver, Nothing in comparison with him!” In Ueno you could admire the cherry blossom. Priest Tenkai wanted to make these places the same as in the mountains of Esino, in Yamato, where different varieties of sakura were grown, which differed in that they blossomed at different times, from late February to mid-March. During the flowering of the sakura in the Ueno mountains, a black gate was opened, to which everyone could pass. The second version of this composition has quite a significant difference. Changed the color of the road – from bluish to gray-brown, with which the pink-reddish foam of blossoming Sabura trees blends well. 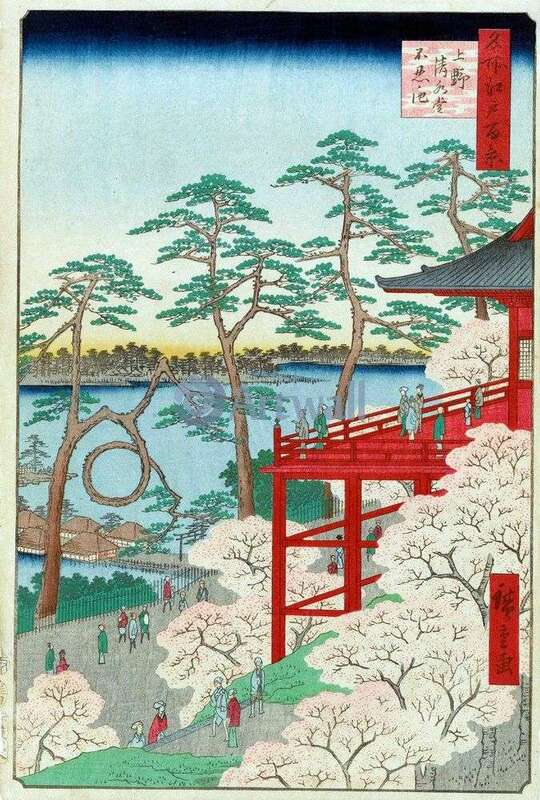 Description and meaning of the painting Kiyomizudo Temple and Sinobadzu no Ike Pond in Ueno by Utagawa Hiroshige.